Recently 23 whales have been stranded across beaches of northern Europe and may have come from a single whale pod. Normally Sperm whales do not enter the north sea as they hut deep sea squid. 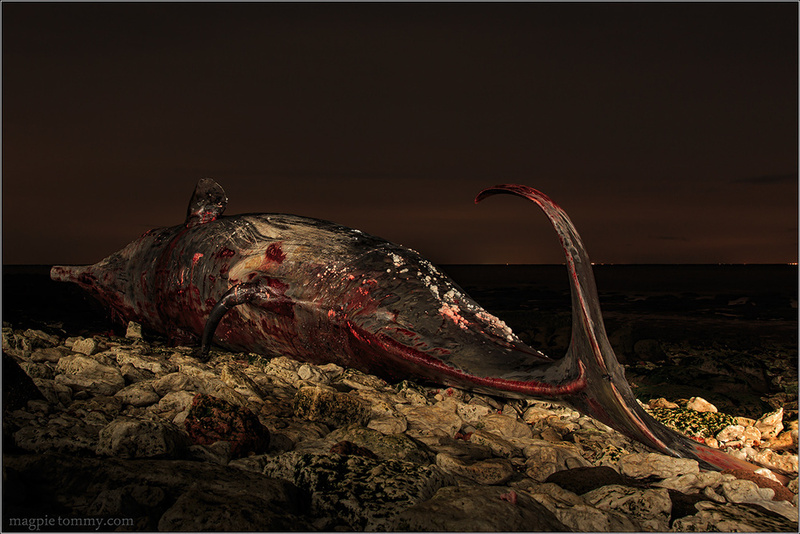 It was a rare and very sad to have the opportunity to photograph the one washed up at Hunstantaon. However according to marine biologists, there may be an upside. “For individual animals, this is certainly a bad thing, but when we get more strandings, that tends to correlate with population recovery.” Paul Jepson of the Cetacean Strandings Investigation Program at the Zoological Society of London. There was a lot of media talk of trophy hunters and people being disrespectful, When we visited there was steady stream of people coming and going and everyone was curious and respectful. However due to an earlier incident the lower jaw had been removed by vets to prevent anyone attempting to remove the teeth. As we were about ten minuets into our walk back to the car we heard the most almighty bang. Followed by a rancid stench of rotting flesh with a sickly sweet after taste. We looked back and could see people torches still moving so we know they were ok, but probably in need of some new cloths and a long bath. For more information on whale and marine conservation and the fight against illegal fishing and whaling check out the work of Sea Shepherd.